Presbyopia is a term used to describe an eye in which the natural lens can no longer accommodate. Accommodation is the eye's way of changing its focusing distance: the lens thickens, increasing its ability to focus close-up. 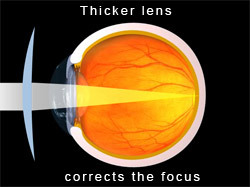 At about the age of 40, the lens becomes less flexible and accommodation is gradually lost. It's a normal process that everyone eventually experiences. Most people first notice difficulty reading very fine print such as the phone book, a medicine bottle, or the stock market page. Print seems to have less contrast and the eyes become easily fatigued when reading a book or computer screen. Early on, holding reading material further away helps for many patients. But eventually, reading correction in the form of reading glasses, bifocals, or contact lenses is needed for close work. However, nearsighted people can simply take their glasses off because they see best close-up. Presbyopia is detected with vision testing and a refraction. The treatment for presbyopia is very simple, but is entirely dependent on the individual's age, lifestyle, occupation, and hobbies. If the patient has good distance vision and only has difficulty seeing up close, reading glasses are usually the easiest solution. For others, bifocals, trifocals and varifocals (glasses with reading and distance correction) or separate pairs of reading and distance glasses are necessary. Another option is monovision: adjusting one eye for distance vision, and the fellow eye for reading vision. This can be done with contact lenses or permanently with refractive surgery.